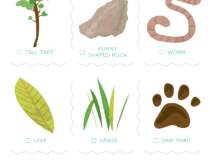 Garden Toys for 4 Year Olds - Super Fun Diggin' in the Dirt! 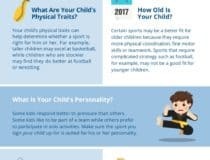 At four years old most kids are happiest outdoors. 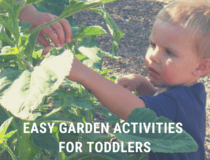 One of the most peaceful and easy ways we’ve played together as a family is in the garden – sometimes growing things, sometimes just digging in the dirt, looking at worms and finding special rocks. 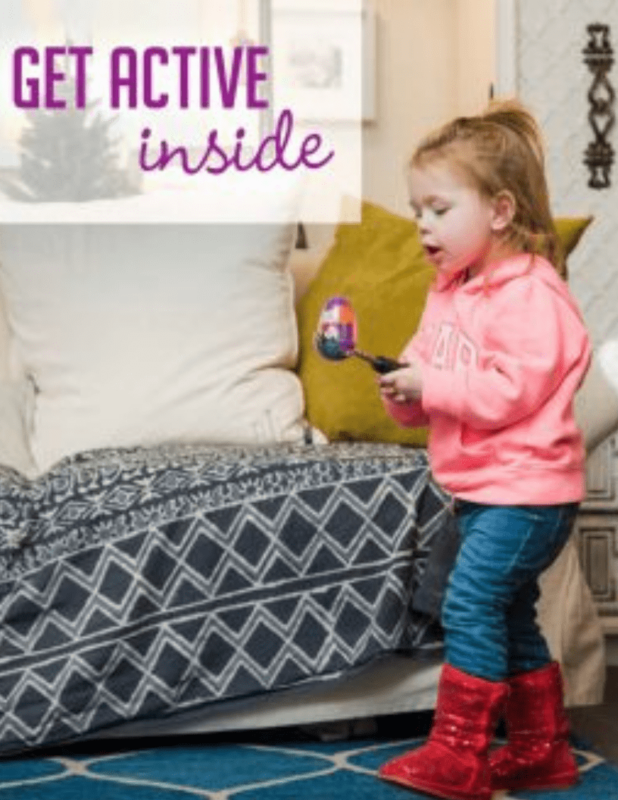 Best Garden Toys for the 4 Year Old in Your Life! An uncle gave our son one of these wheel barrows when he could barely toddle behind it. It’s actually a little awkward for toddlers to push with the one wheel, but at 4 it was perfect. It lasted for years of dirt and mud moving, toy moving and joy-of-pushing-around use. 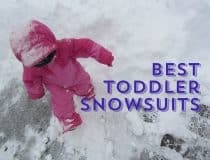 All three kids loved it and we only got rid of it when they all got too tall for it to be a good fit. 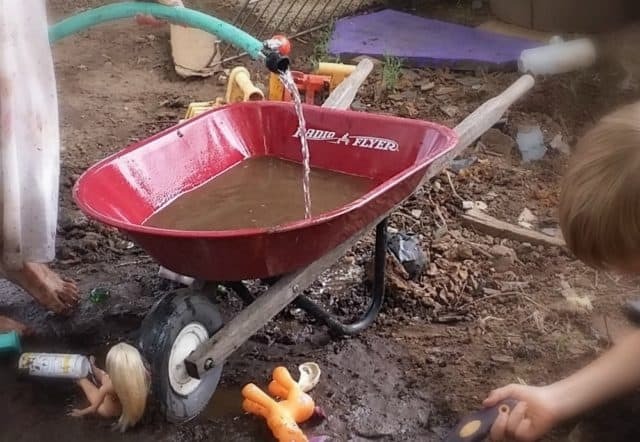 Naturally kids want to copy the grown ups in the garden, and this is easiest if they have their own set of kid-sized garden tools. We’ve liked the ones that have metal heads because they’re easier to use for digging. 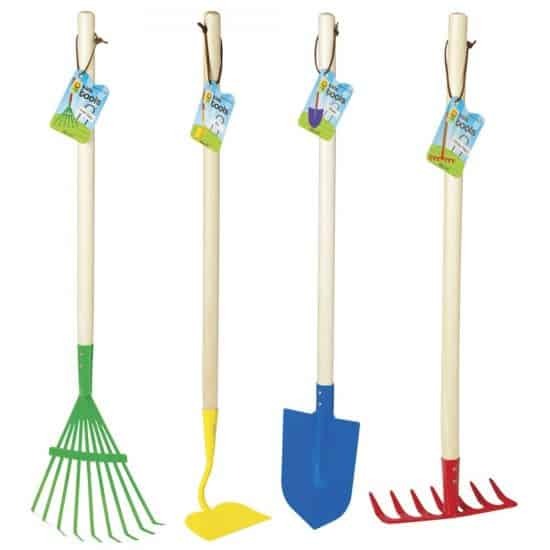 Metal Garden Tools for Kids with Wooden Handles – This set by Toysmith served us well, though the wooden handles eventually got lose as they got older and dried out. 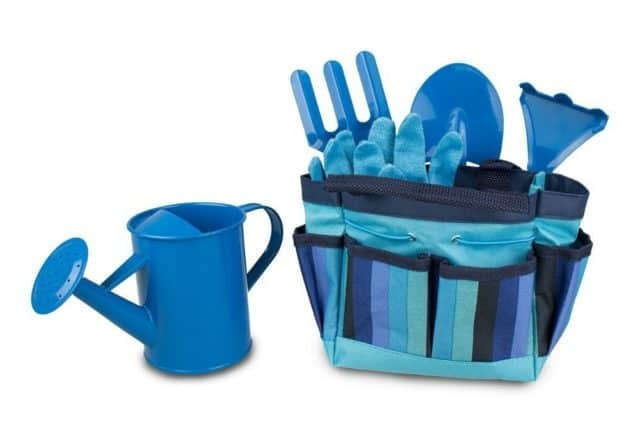 Garden Tools for Kids with Tote – If you want one that comes with a convenient tote, this set by Gardenline gets good reviews and comes with a tote and a kid sized watering can too. Garden Toys Set with Wagon – This set of garden tools comes with a wagon to cart everything around. The downside is these are all plastic, and thus may not have the durability. However, they are lightweight and can double as beach toys too. Having tools around that little kids can use to do yardwork makes it fun to rake leaves, dig a hole or move compost. We were able to find a shovel and rake at our local hardware store, but if you want to order online, Toysmith makes this set of kid-sized tools (about 28 inches in length). It includes two rakes a shovel and hoe. Sometimes we as grown ups like having the small shovel around for scooping out compost from the compost bin. Melissa & Doug Giddy Buggy Good Gripping Gardening Gloves With Easy-Grip Rubber on Palms – Reviews state these are too big for a 2 year old, but may fit a 4-7 year old nicely. JustForKids Kids Genuine Leather Work Gloves, Kids Garden Gloves, 4-6 Years Old – If you prefer a leather glove, this pair is made in kid sizes and has a ton of positive reviews. 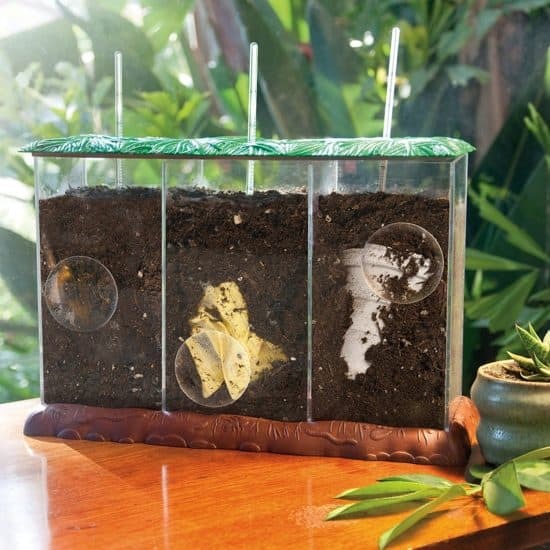 Compost can be fascinating when kids get to see the process happening in this see-through compost bin. Kids can compare how fast different materials decompose. 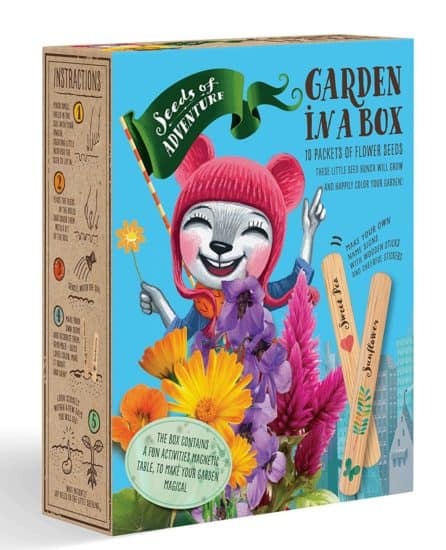 Seeds of Adventure makes gardening kits and games for kids. You can get a Flower or Herb Vegetable Garden in a Box. They also make a memory game and a go-fish game, both of which feature gardening information and come with seed packs as well. Give kids a space to play outside with a simple pop up tent. 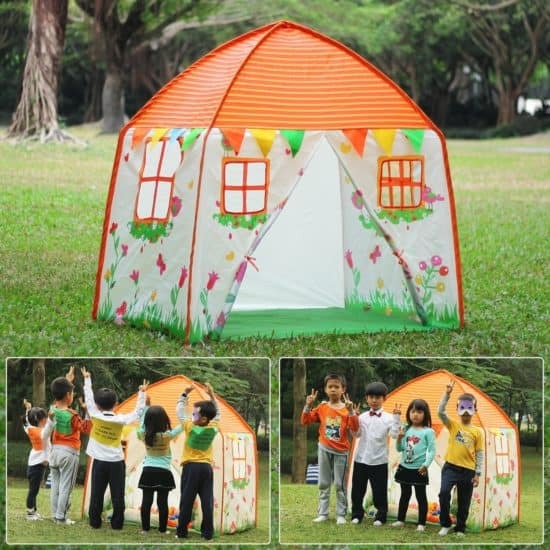 The Homfu Kids Tent Playhouse can be used indoors or out and gets positive reviews for being large and having windows. However, if you prefer not to have separate poles for set-up, you may like something like these twist and fold pop up tents from GreEco.